Venenatis is a Spider boss found east of the Boneyard in mid-wilderness. 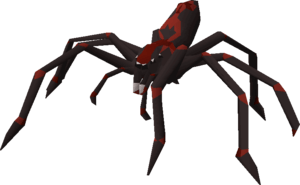 As Venenatis is a Spider, Venenatis kills will count towards a Spider slayer task. Venenatis is a boss often farmed for a chance at the Dragon Pickaxe or the Treasonous Ring. She also has a few more worthwhile drops, like 100 noted Snapdragons. The most common tactic to use at Venenatis is full Veracs as Venenatis has extremely high melee defences. The Verac’s set effect gives you a 25% chance of ignoring this high defence – combine this with the fact that you can protect the full set by utilising the Protect Item prayer, and Veracs makes a perfect armour choice for this boss. The overall strategy for the Venenatis fight is pretty simple when utilising Veracs. First off, when she spawns you want to lure her into a multi-way combat zone – as Venenatis will only take partial damage while in a single-way combat zone. You want to use the Protection from Magic prayer in order to protect yourself from her magic attacks and give partial protection from her web attacks. You simply then just have to keep your health high enough to avoid being one-hit by her powerful melee attacks, and watch out for PKers. If you have 94+ Magic, you can optionally bring runes to cast Vengeance.